Original encaustic on cradled panel. 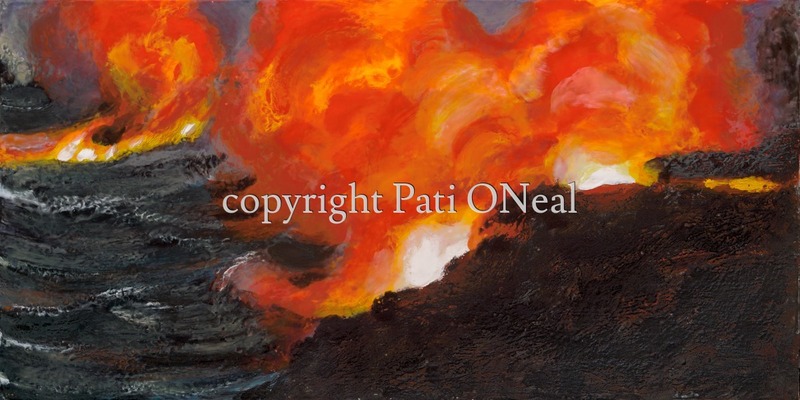 This textured work captures the energy of the Hawaiian goddess of the volcano, Pele, meeting the Hawaiian god of the ocean/underworld, Kanaloa, as molten lava flows into the ocean on the Big Island of Hawai'i. Original available, contact artist for purchase information. Limited edition giclees are on heavy archival rag paper with a protective coating. (Suitable for mounting and framing glass-less.) Open edition matted mini-prints are also available.